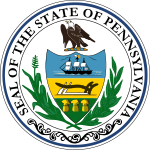 The 1930 United States Senate special election in Pennsylvania was held on November 4, 1930. Joseph R. Grundy, incumbent Republican appointed to fill the vacancy created by the unseating of William Scott Vare, was defeated for re-nomination. The Republican nominee, James J. Davis, defeated Democratic nominee Sedgwick Kistler to win the election. ^ a b "GRUNDY, Joseph Ridgway, (1863 - 1961)". Biographical Directory of the U.S. Congress. Retrieved 4 July 2012. ^ "PA US Senate". OurCampaigns. Retrieved 3 July 2012. This page was last edited on 15 December 2018, at 20:15 (UTC).